For our last day on Francis Marshall, we turn to British comics artist, author and comics historian, David Roach. 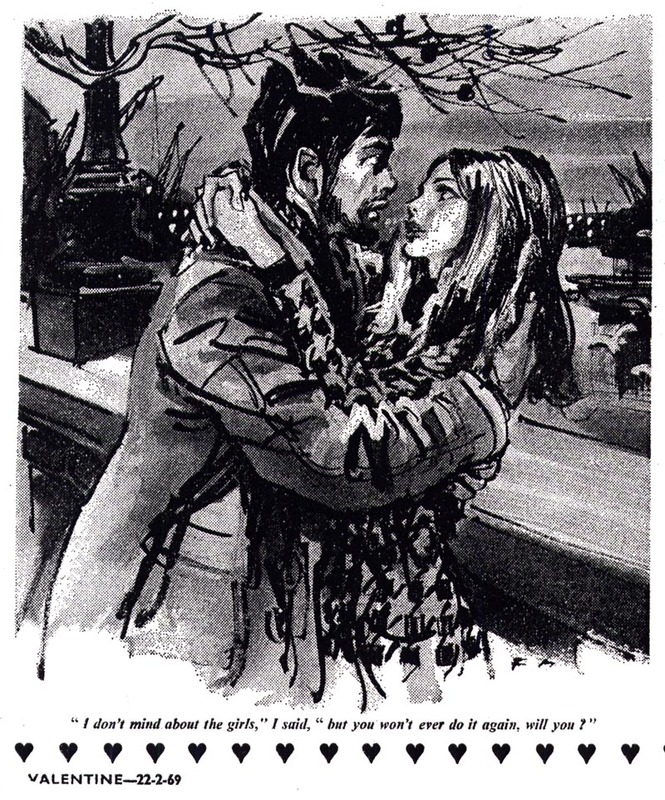 David kindly sent me photocopies from some late-1960's issues of a British romance comic called "Valentine". 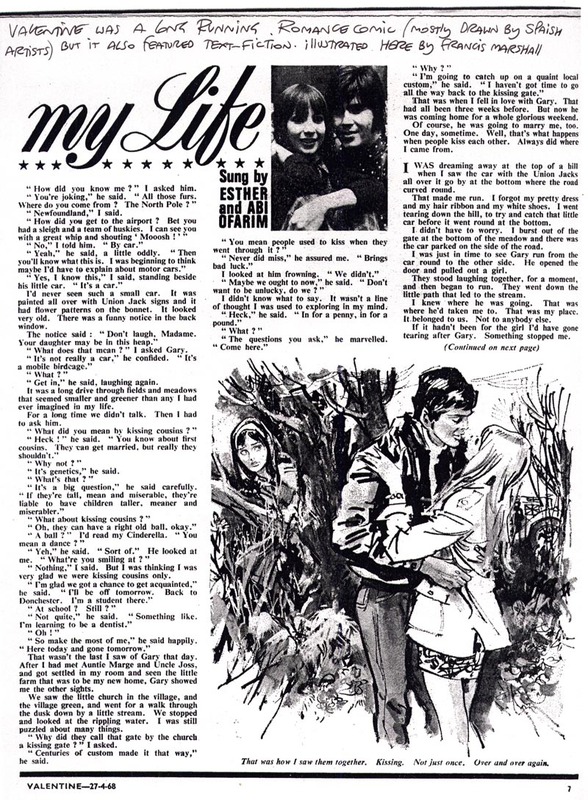 As you can see from David's note below, Francis Marshall provided illustrations for the short text stories that were typically sandwiched between the comics sections of each issue. David writes, "Marshall never actually drew strips , but Fleetway at that time certainly did have some use for straight illustrators." " Not only did lots of their comics have fiction , as you can see here in Valentine, but they often carried illustrated features or painted covers." 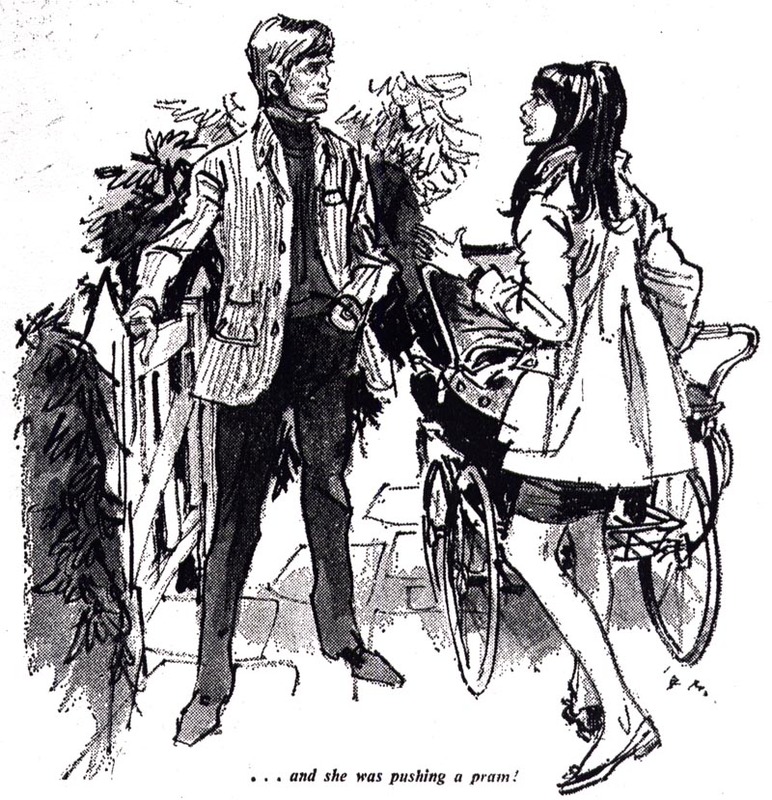 David continues, "Marshall painted quite a few covers for the upmarket girls weekly "Princess" in 66-67 so he certainly had an impact." Knowing how comics were typically looked down upon by the general public in North America at the time, I asked David if drawing for these British publications would have been 'a step down' for an illustrator of Marshall's stature. 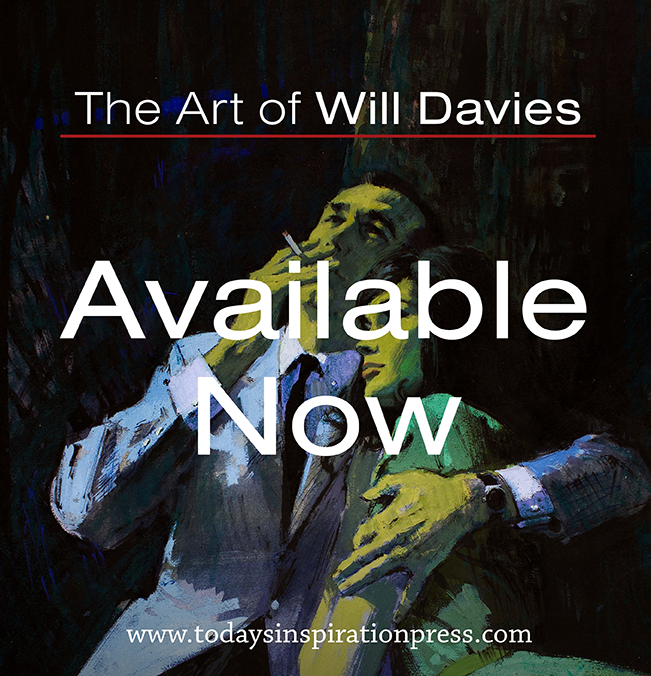 After all, this was an artist who had illustrated for Vogue, Reader's Digest, and countless other prestigious clients, as well as being the author/artist of a half dozen books including one on magazine illustration. David replied, "If anything I'd say comics were probably held in even lower esteem here than in America but it might just have been that he needed something to tide him over between jobs. In Britain up until the late 70's most artists worked through agents such as Rogers, Temple, Kearley, Associated Artists, Artists Partners etc. so if the agent had a relationship with Fleetway/IPC they could just as easily obtain work for their clients from a glossy woman's magazine or a comic. Clearly the comic payed less but then maybe Marshall wouldn't need to put as much effort into this stuff." 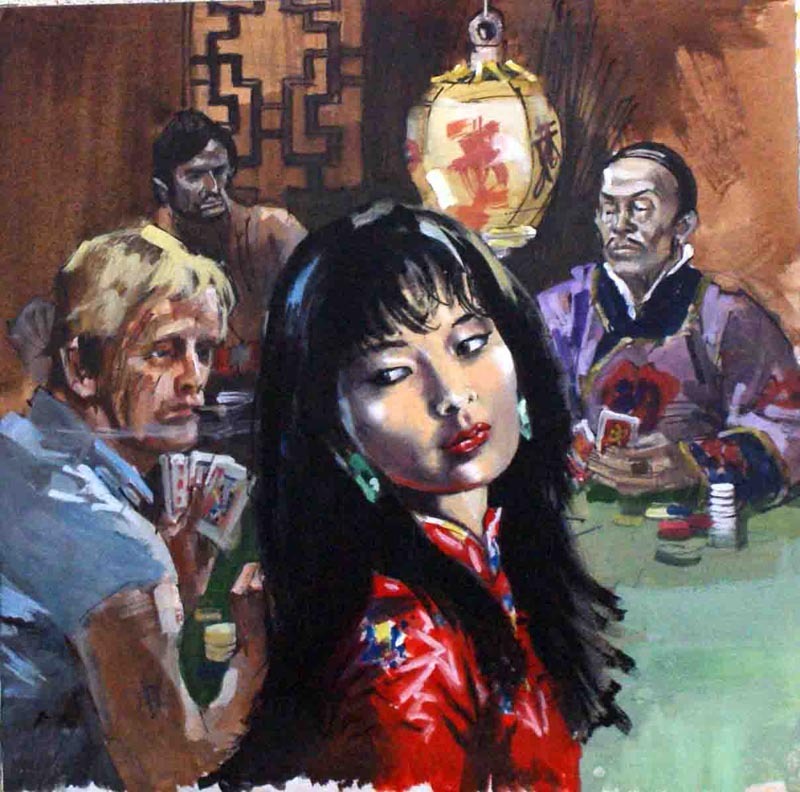 Finally (and again, thanks to David) we have a few examples, scanned from the original art, of Marshall's fully painted work done during the latter part of his career. About these pieces, David writes, "I spent much of yesterday up in London sorting through vast piles of art up at the Book Palace and dug out these Francis Marshall originals. 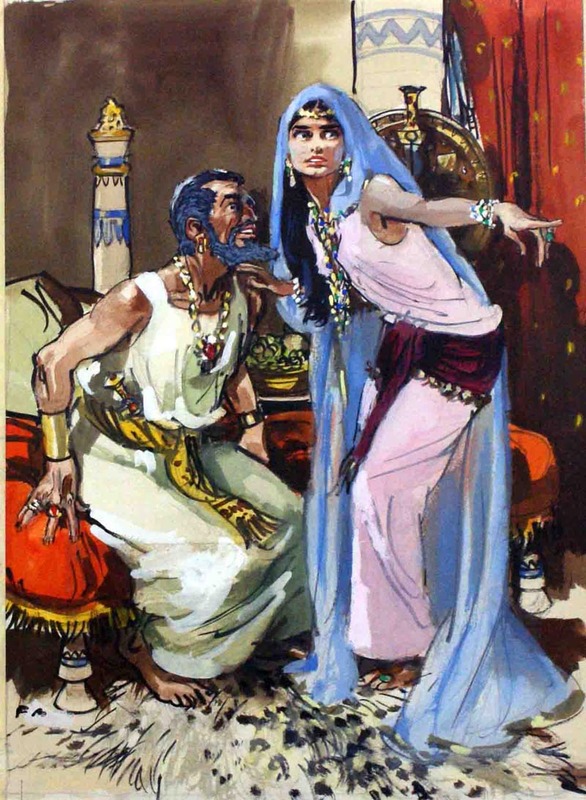 One is from "Bible Stories" circa 1962, [below] the others are unknown - but rather wonderful." This last piece is the latest example we have of Francis Marshall's work. 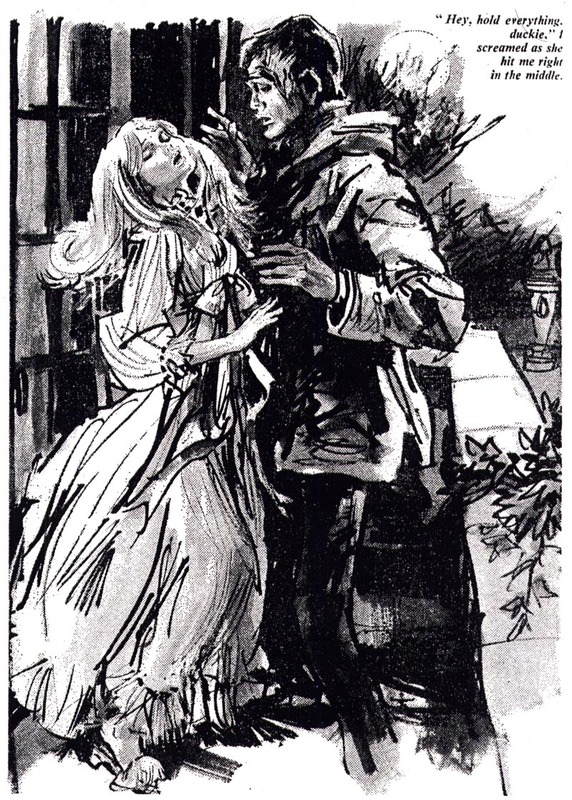 Done in 1975, just five years before Marshall's death, it was for a "romantic thriller" paperback cover. Thanks to Geoff at The Book Palace for sharing these scans with us via David. And thanks to David Roach for providing today's art and information. 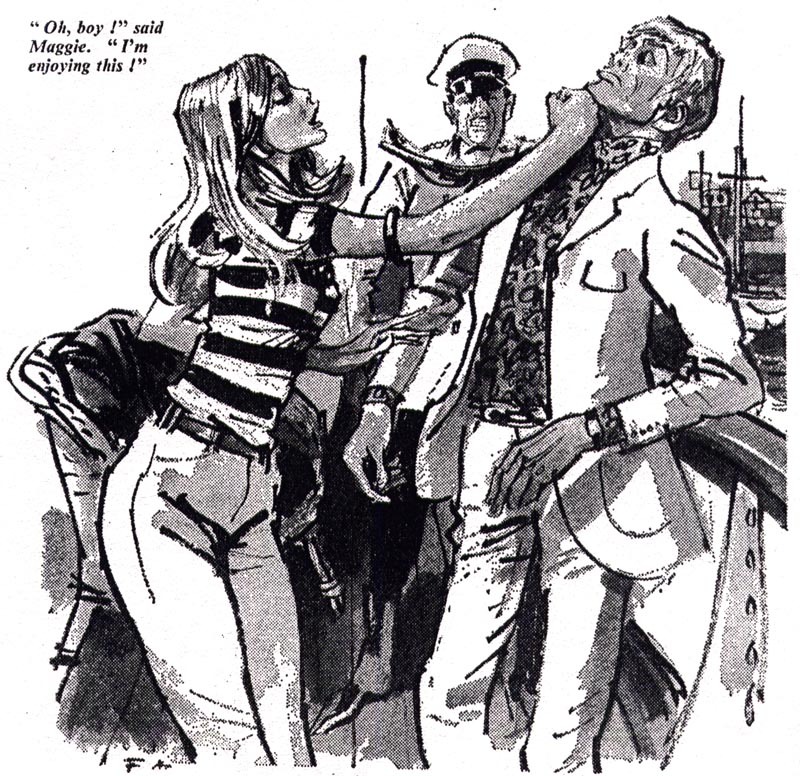 Incidentally, Geoff has this piece and several other Francis Marshall originals available for sale (including a great shark attack illustration that's quite unlike anything we've seen by the artist this week). For those interested in seeing these pieces, click here. Thanks to David for finding these lovely images, they're all new to me. 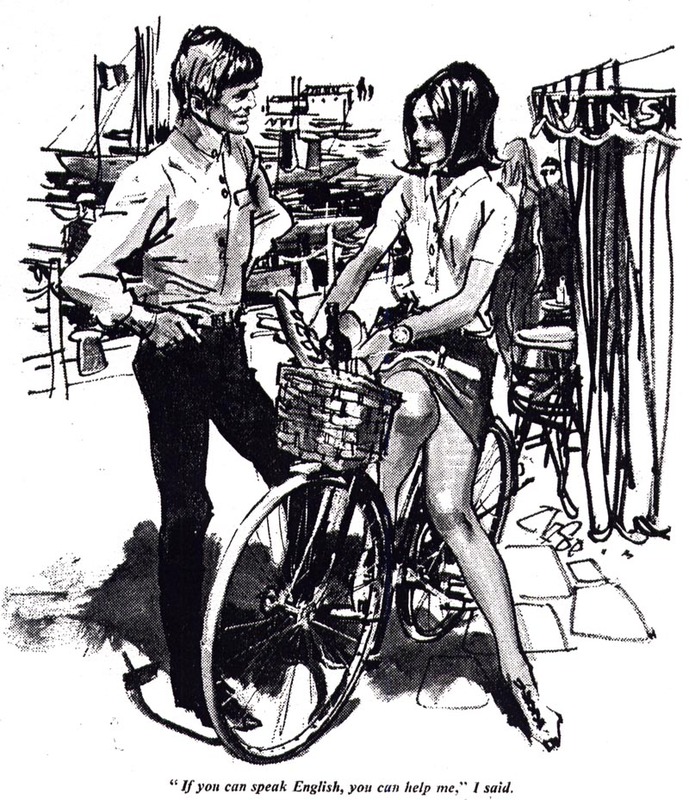 2 points,yes interior illustrations for this kind of teen oriented annual were often of questionable quality, with rare exceptions.But looking at these FM half tone pictures,I see no evidence at all of a rush job, in fact his faces have a higher level of 'finish' than his Reader's Digest illustrations and there is overall more detail in the renderings.Secondly, I'm pretty sure Francis Marshall did do some quite stylish limited colour and black and white picture strip work, but they would have been better paying advertising commissions rather than the considerably lower rate comic features. Very interesting, Chad - I would love to get a look at those advertising strips you mentioned! As for rush jobs - I get the sense that Marshall always had the advantage of being a fast worker. Perhaps that made this sort of assignment relatively painless by comparison with other artists. My interest lies more in how Marshall would have perceived himself doing these pieces. Did he feel depressed that he'd had to "sink this low"... considering the stigma attached to working for the comics back then. Yeah, I was going to say (before I got the end of the post and saw your comment) that the shark illo is exceptional! Leif, do you have any info on his working methods.. direct from models, photos or drawing out of his head? They are so stylized, and they don't appear to be drawn directly from photos.. it's hard to tell. British artists seem to have that strong academic discipline in their work.. spartan training. Draftsmanship seemed to be paramount.. and how splendid they could/can draw and paint.. usually not inventive or experimental, but wonderful rendering skills and refined taste. Even when done in a loose stylized manor, they really come off beautifully. British WW2 art is unsurpassed by anything I have seen, in all of Europe or America. And, it can be seen in other art forms.. the BBC period films are visually very real to me.. beautifully filmed with the eye of an artist. Great week on FM, Leif. Thanks Tom; I'm glad you enjoyed this week. Based on what little info I've read ( and with the help of some of this week's contributors and commentors ) I get the impression Marshall sketched relentlessly and then went back to those sketches (along with collected photo reference) and combined all of these elements to create his illustrations. We have the one example from earlier in the week that shows his very rough sketch and then the inked final... so we know he wasn't a straight-to-ink man like W. David Shaw or the fashion illustrator Eric. Perhaps someone else can provide more detail about FM's working method? I first became aware of Francis Marshall about a year and a half ago while perusing a Flickr set on Reader's Digest illustrations -- four images in particular caught my attention (here, here, here and here), all signed by "Francis Marshall" or "FM". 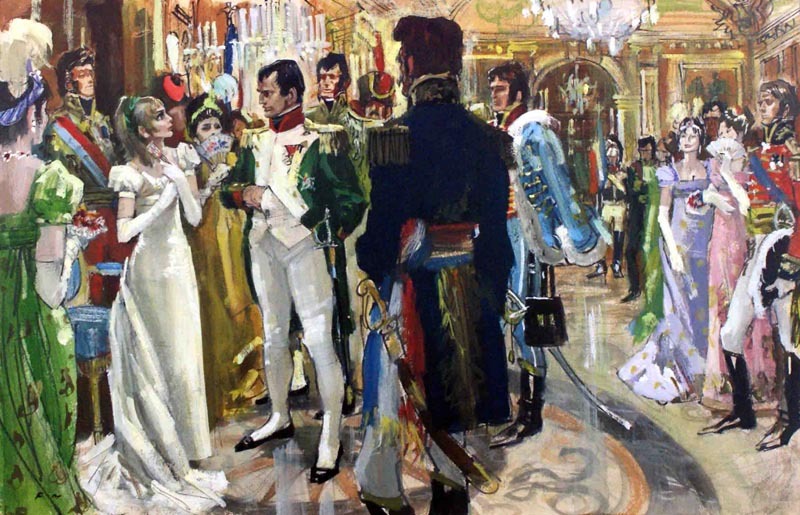 The compositions were pleasing, the figures exaggerated but very much based in reality, the technique marvelously loose and self-assured, perspectives accurate yet as pushed as the figures - wow. I searched for more information and found virtually nothing about this artist. (I did find that apparently he wrote a book on Drawing The Female Figure that somebody scanned and was selling the .pdf - I'm tempted to pay the five bones and see what it is... maybe.) But you came through once again with a great series of posts that answer a lot of the questions I had about Mr. Marshall. Thanks so much! Oh, one last thing, apparently he illustrated the movie poster for The Red Shoes (1948) as well. Percy Bradshaw's book "Come Sketching" (1949) has a whole chapter on Francis Marshall, covering his career and working methods. Lot and lots of sketching, and a strong emphasis on being able to draw from memory (because you can't sketch in many society functions). There is a page of his astonishing "doodles" - beautiful little pen drawings of characters in costume, entirely out of his head. Anthony; Thanks so much for sharing these links to even more of FM's art - the four RDCB scans are now some of my favourites by the artist. Incidentally, like you I found and contemplated buying the DL for the FM Drawing book... but ultimately decided, with so many inexpensive used copies for sale on the Internet, that I'd wait and get a physical copy some time in the near future.